Frameless or European style cabinets are our specialty. For generations, Old World craftsmanship has been passed down through the Miller family. It is what the family has been known for for a long, long time. Today, Albert Miller, the owner of Miller’s Casework, still holds true to the proud craftsmanship his family built their name on. He has passed his knowledge and skills onto his entire team. Along with the discipline and attention to detail that makes classic works of art, the modern technologies that Albert has incorporated into the design process create the perfect balance between classic and modern. This is the balance we create in our frameless cabinets. With the help of the industry’s finest CNC software and equipment, we precisely cut our perfectly styled cabinets to your exact specifications. Everything we manufacture, whether it be for a small or large commercial application, always meets or exceeds the standards of the Architectural Woodworking Institute. Why Choose European Frameless Cabinets? These cabinets go by many names – frameless, European, full-access, 32 millimeter – but regardless of what you call them, the reasons to choose them for your residential or commercial customers are numerous. Frameless cabinets are thicker than your typical American cabinet; they use stronger case parts and come with no face frame. The lack of a face frame creates greater access to the interior area of cabinet and increases your storage area by 10 to 15% compared to traditional framed cabinets. Roughly 85% of all cabinets made in the U.S. are framed. Frameless cabinets were developed in Germany after WWII as a cost-efficient way to rebuild. The popularity of frameless cabinets has since spread throughout the world. Today, they are the dominant cabinet style in Europe, Asia, Latin America, and Canada. Although not fully caught in residential settings, frameless cabinets have become the standard in American commercial offices, schools, and medical buildings. Materials: We use a mix of High Pressure Decorative Laminate (HPDL) and Melamine. We have templates for which material is used where within a cabinet, but our designs are completely customizable and are made to order. HPDL: The more durable of the two materials, HPDL is made from several thin layers of resin, decorative paper, and a clear protective top sheet. The resulting rigid surface is highly resistant to stains, scratches, chemicals, and heat. Melamine: While not as durable as HPDL, Melamine is more cost-effective and provides more project flexibility. Made from thin layers of resin impregnated papers, Melamine is ideal for vertical, non-weight bearing surfaces. Colors: HPDL comes in a wide variety of colors while Melamine has two basic options: white and almandine. 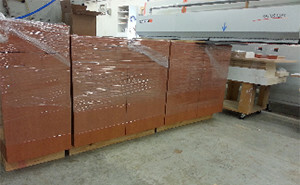 If we don’t have the color you want in stock, we can easily place a special order to get what you need. Brands: WilsonArt and Formica are our two main product providers although other options can be arranged if necessary. Door and door faces: ¾” particle board with HPDL exterior, matching 0.05mm PVC edge banding, and liner surfaced particle board back. Standard drawers: Grass zargen unigrass series 100# metal boxes or 5pc. Drawer boxes: 5/8″ thermo-fused melamine with white epoxy coated 100# bottom mount extension sides. Side mount ball bearing slides are also available. Hinges: 120º fully adjustable nickel plated hinges are our standard although we also carry 170º and heavy duty 5-knuckle hinges. A number of other box options and upgrades are available as well. Everything listed above are just templates. Anything can be customized to your specifications. 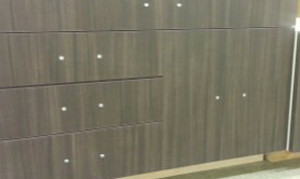 HPL & melamine casework options available! We provide residential and commercial frameless cabinets for cabinet shops, cabinet dealers, mills, and other vendors in Tennessee and certain areas of Georgia, Alabama, and Kentucky, Based out of Sparta, Tennessee, we proudly serve customers in Cookeville, Crossville, Knoxville, Morristown, Kingsport, Johnson City, Sevierville, Marvyille, Cleveland (TN), Chattanooga, Columbia, Murfreesboro, Nashville, Jackson, Clarksville, Springfield, Gallatin, Hendersonville, and all of the surrounding communities. We serve Tennessee, Alabama, Georgia & Kentucky! To discuss your frameless cabinet needs today, give us a call at 931-739-9292. We’re more than happy to provide you with a free quote and talk you through any questions you might have.